With a spot for bras, socks and underwear, these drawer inserts turn your intimates drawer into an organized dream. Like the rest of the world, I binged Marie Kondo's new Netflix show that shows how she visually helps clients declutter. I'd read her book "The Lifechanging Magic of Tidying Up" a couple years ago and had already put some, not all, of her tactics into play. One of my favorites is how she folds underwear, socks and bras. They look so nice and organized ... very satisifying! She advocates folding underwear in thirds and then rolling it, as well as matching socks side by side and then folding them in half or thirds, depending on length. This keeps the elastic from stretching. Until recently, I'd followed her advice of using a shoebox to store my undies and socks in the drawer, which worked well, but was not pretty. 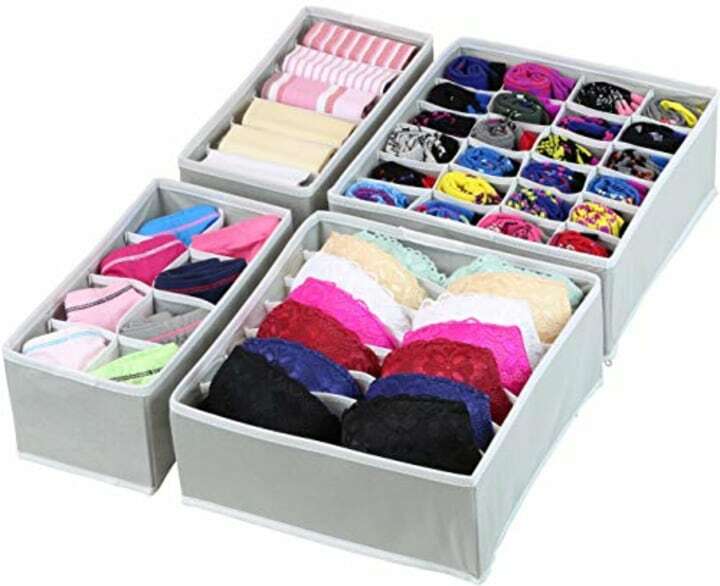 So, I checked out what organizing products were available on Amazon and found this super cheap intimates organizer that could individually divide underwear, socks and bras. An Amazon Choice product shipped via Amazon Prime, the MIU organizer is a Marie Kondo dream. No wonder it boasts more than 1,400 reviews and a 4.3-star rating. It comes with a five-cell bin for bras, an eight-cell bin for boxers or briefs, a six-cell bin for underwear and a 16-cell bin for socks. When mine was delivered, I hastily unpacked it (it comes in a flat sleeve), but admittedly was confused as to how to put them together. They come all flat with hard plastic dividers. You have to figure out how to fit the plastic dividers into the bins. I called my husband in for help. He couldn't figure it out either. Then, in a stroke of brilliance we checked the plastic bag they came in. And the instructions were right on there. You just slide the plastic dividers into a sleeve on the outside of each "bin" to help them hold their shape. Perfect. Now to decide what to put where. I used the 16-bin organizer for my socks — longer winter socks on one side and shorter summer socks on the other. I figure I can just rotate it as the seasons turn. All my socks fit except for a handful of running socks, which I just left folded alongside. I used the six-cell bin to hold my underwear with two pairs in each cell, one on top of the other, and the eight-cell bin to hold my fall-back underwear (you know, in case everything else is dirty). Lastly, Kondo does not suggest folding your bras cup inside cup, which is what I had always done, but rather fully open with the straps wrapped behind. The bra organizer allows you to do just that, fitting a couple bras in each cell if needed. Are the organizers worth it? I've used the organizers for about two weeks, and I absolutely love it. When you look in the drawer and see everything so neatly folded, it motivates you to keep everything just the way it is. Plus, another of Kondo's major points when organizing is to arrange things so that you can actually see what you have. These organizers allow you to clearly see what you have and choose what you need. 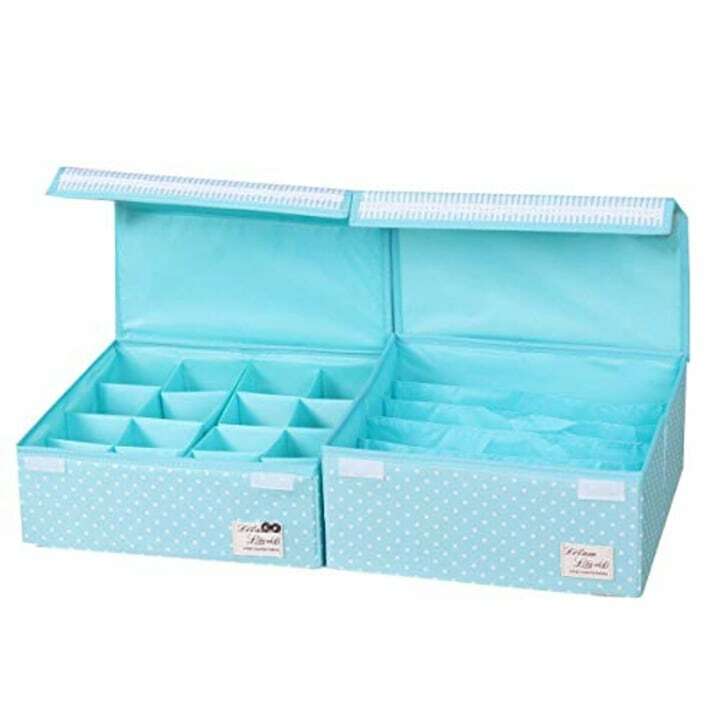 Another popular organizer is the Simple Houseware Closet Underwear Organizer Drawer Divider. This was the first one I saw when researching organizers, as it is the No. 3 best-seller in drawer organizers on Amazon and the No. 4 best-seller in closet organization systems. But, it was sold out at the time I was ordering. It's very similar but has seven cells for bras and 24 cells for socks. You could also use the 24-cell item to hold boxers (I fold my boys' in half longwise twice and then roll them) or ties. Some people reported in the reviews and questions that bras larger than a 36C or D did not fit into the bra organizer comfortably. You should also make sure the dimensions fit within the size of your drawers. For a cuter organizing option, check out this foldable washable storage box. Available in a variety of designs and colors, these give you a stylish way to store bras, underwearand socks. There are six cells for bras and 16 for anything else. Plus, it comes with a lid to help keep dust out. I suppose it would also be easy to travel with, should you be headed somewhere for a longer stay and want to keep all your intimates together.